Now that I'm a blogger (I think I've been blogging long enough to call myself that) one thing I do lots more of - is read other people's blogs. Mainly for two reasons - 1. To keep up with changing trends - you know to see what's going on in the lifestyle, fashion, baking, beauty worlds and 2. Because a big part of blogging requires you to communicate with other blogs - leave a comment here or there, follow them on social networks (Bloglovin, Twitter, Instagram etc etc). So I read a range of different blogs - I won't go into detail - I'd be here for days. I've become particularly interested in posts specifically about social media and its effects when blogging or posts on how to become a good blogger and the like. They're really interesting and I love to see how each blogger explains the process in their post - you know what they have done, how they conduct their blog. One post (part of the reason for this post) explains the importance of keeping your blog and posts consistent. Which means perhaps ending your blog with the same 'signature' for example - since I began my blog in June (of this year) I made a signature on a website and used that signature/iamge at the end of my posts. I also added the links under it to all my social media accounts. Doing this I felt that my blog was consistent and would give people the impression that my blog was professional and would make them want to come back. Other things may be the format - size, colour, font of text, or perhaps keeping images all the same size. 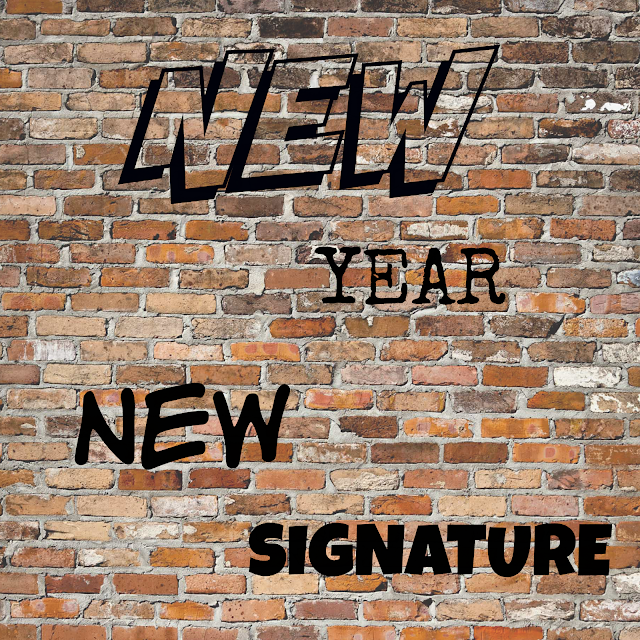 I decided that since we are going into a New Year that I should change things up and change my signature. I have also planned to change my blog design entirely - however finding a blog designer that isn't too expensive is proving harder than I thought (but more on that later). I have not changed my signature drastically - just the font. You'll probably think - jeez he's rambled on and wasted my life all for a font change. However the post was more about people's views on blogging and social media. I feel it is a bit more quirky and less 'snooty' shall we say like my last signature. I think it portrays my personality a bit better and I want that to shine through my blog (if that makes sense).